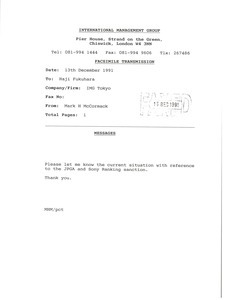 Concerning the attached photographs taken at the World Match Play Championship. Enclosures not with letter. 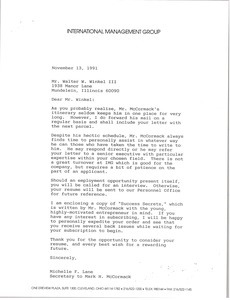 Lane responds to Winkel's letter regarding employment. Older people - Concerning Grabe's interest in sponsorship of the Senior Skins Game. 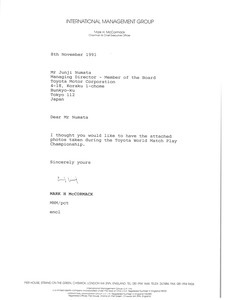 In response to Fukuhara's fax, McCormack asks about the status of the JPGA and Sony Ranking sanction. 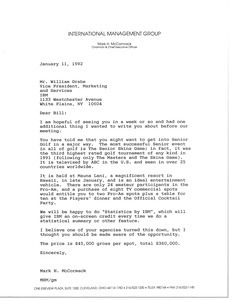 McCormack sends a letter and resume from Walter W. Winkel. 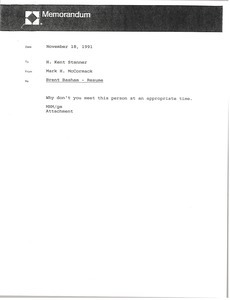 McCormack sends a letter and resume from Brent Basham. 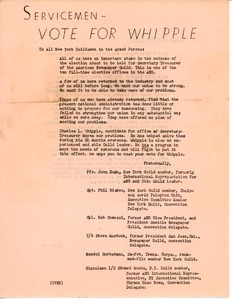 Leaflet for servicemen connected with Whipple's run for ANG Secretary-Treasurer. 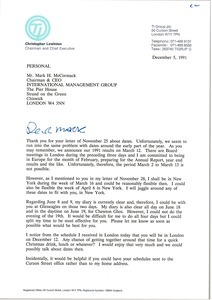 McCormack writes regarding a meeting with golfer Sandy Lyle. They discussed his Nitto contract. 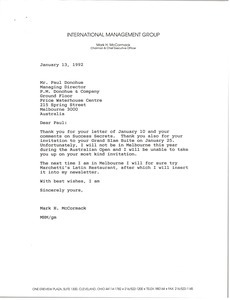 McCormack thanks Donohue for his letter, and responds that he cannot accept his invitation to the Grand Slam Suite, due to the Australian Open. 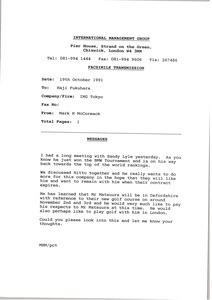 London (England) - Lewinton writes regarding scheduling a meeting, his son Peter Lewinton and sends correspondence on the topic of hiring a Chief Financial Officer and business with International Management Group. 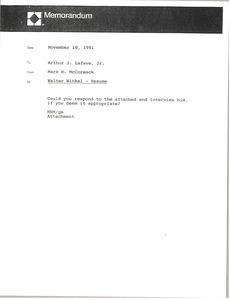 Peter Lewinton's resume is included.